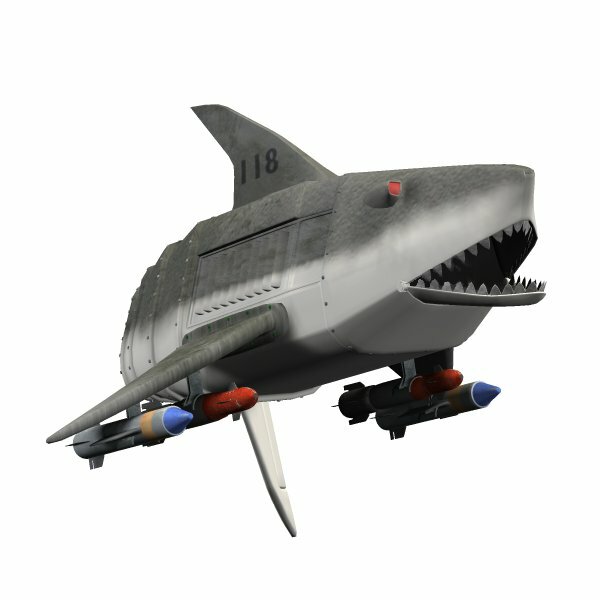 The Robo-Shark was created in the 1980`s by scientist in the former soviet bloc of Kajagogomeshanistain. Codenamed KMA-658 the Robo-shark was originally designed as a wire guided remotely controlled device. The intention was to use the machine to guard harbours against attacks by divers and for undersea minefield clearance. Divers could also be incapacitated by the onboard mouth cannons or external weaponry. Or on touching the nose the powerful jaws would spring open trapping any diver. The jaws where also capable of biting through cables or destroying mines. As testing tended to be rather fatal to the test divers, the project stagnated until the mid 1990`s when the technology was purchased by Q-Tex, a British military research company. Q-Tex used the shark as a test bed for their semi-autonomous Artificial Intelligence system called DMOS (Deep Marine Operating System) and project became ubiquitously known as `Robo-Shark`. Q-Tex used the project primarily for peaceful marine research before licensing the system to the US Navy. Who developed a submarine rescue system. The US Navy later adapted the Sharks pressure equalisation system, in conjunction with the European Space Agency, for a joint mission to explore the gas clouds of Jupiter. Q-Tex also licensed a commercial version for sports racing. Using a more powerful CAT engine, than the standard heavier Commings engine, these racers proved popular in Middle Eastern countries. `Default` - the Q-Tex natural colour scheme with US Navy markings. `Rusty` - a typical Russian KAM-658. UK and US versions where made from aluminium and tended not to rust. `Racers` - 3 examples of the non-military variant. The teeth tended to be replaced with Styrofoam, as the sharp teeth could have a diver�s eye out. 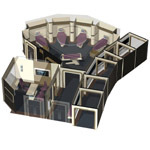 `Space Probe` - An example of the proposed Jupiter version. `Rescue` - The US Navy deep sea rescue system.